Order Natracare Ultra Pads Super + Wings from the Online Health Food Store UK. 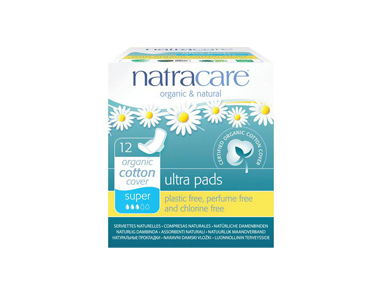 Buy Natracare Super Ultra Pads Regular with Wings (12) and other quality Pads & Towels safely online in the UK. Soft certified organic cotton cover. Absorbent cellulose core to keep you dry. Waterproof plant-based back. No plastic and no perfumes or dyes and totally chlorine free. Biodegradable & compostable as well! As official Natracare stockist in the UK, we sell quality Pads & Towels to customers throughout the UK in England, Wales, Scotland and Northern-Ireland. View more products on the Online Health Food Store from Natracare. Where to buy Natracare Ultra Pads Super + Wings safely online? Shop at the Online Health Food Store if you are wondering where you can buy Natracare Super Ultra Pads Regular with Wings (12) safely online in the United Kingdom. Our Health Shop is located in the UK and our award-winning independent has been serving customers in England, Wales, Scotland and Northern-Ireland since 1976. You can buy our Organic and chlorine free Sanitary products and other quality Pads & Towels online and we post out orders to any UK address. Ultra Pads Super + Wings - Natracare Super Ultra Pads Regular with Wings (12) in Pads & Towels and Female Hygiene.